Branded residences are slowly gaining in popularity in Vietnam for a host of reasons. The “love affair” in Southeast Asia between real estate developers and hotel brands is morphing into a feeding frenzy. 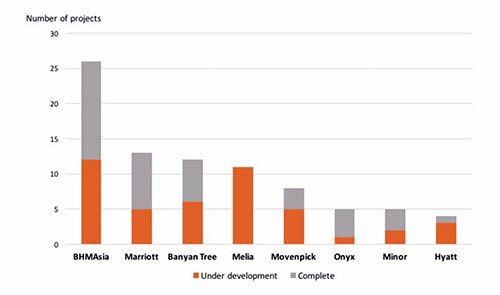 With nearly 100 mainstream hotel-branded residence projects and over 21,000 units completed, the next three years is set to take the sector into bold new territory, according to market researcher C9 Hotelworks’ new Southeast Asia-focused Hotel Branded Residences Market Trends between 2018 and 2020 report. It is forecast that newly-completed units in the region will see a massive 83 per cent rise over existing supply, and Da Nang is listed among the Top 5 project locations in order of volume. Branded residences are not hotel projects but differ from serviced apartments. They are usually prime residential products leveraging the quality of the hotel brand to create an aspirational product, reflecting luxury and prestige. Branded residences also enjoy a full suite of luxurious amenities and services that usually form part of a resort or hotel complex. As for the attraction of hotel-branded real estate, C9 Hotelworks’ research found that market-wide premiums of recognized hospitality groups range from 25-35 per cent against independent properties. In recent years, Vietnam has become an investment destination for international real estate developers as opportunities and profits in other markets in the region fall short of expectations. The number of hotel operators offering branded residences has been gradually increasing over recent years as a result, including world-renowned brands such as BHMAsia, Marriott, Regent, and Hyatt, and global serviced apartment operator The Ascott Limited. The Asian-based global hospitality group Regent Hotels & Resorts and Vietnamese property developer the BIM Group recently signed a management contract for a mixed-use development on Phu Quoc Island. Regent Residences Phu Quoc, the first six-star resort project on the island, is expected to open in the final quarter of 2019 and comprises a luxury resort and branded residential units. A launch ceremony was held in mid-December for the model villas. “The number of investors who registered to buy our villas is higher than the number on sale,” a representative from BIM told VET. The project has investment capital of nearly $90 million and is located at the BIM Group’s Phu Quoc Marina tourism complex on Long Beach, famous for its beautiful sunsets, and covers 12 ha with 76 luxury villas, 42 sky villas, and 120 hotel rooms with many high-end facilities. As a global luxury hospitality brand, Regent has set the benchmark for luxury hotels worldwide and is expected to bring new standards to the resort market. It guarantees buyers a profit of at least 9 per cent per year over nine years, together with a revenue sharing policy of up to 40 per cent. D1Mension is well-placed in terms of product positioning, exclusivity, and offering, with only 102 apartments for sale from two to four bedrooms and penthouses with unique “sky” facilities that provide a life beyond measure for only the most discerning of homebuyers. For those looking to diversify their investment, Mr. Chen said, the project presents buy-to-lease investment opportunities in a prime location. “With these facilities, buyers can invest in a project with sustainable value for the mid to long term,” he added. Buying branded residences provide buyers with security, an element of prestige, and, most importantly, a hassle-free holiday home, and buyers can expect hotel services. They also provide investment benefits, with management by the brand also giving buyers a key investment opportunity. “Buyers are willing to pay more for branded residences because they’re paying for the beautiful décor and design, which allows them to enjoy a comfortable hotel lifestyle at home,” said Mr. Gasparotti from Savills. One of the distinguishing features of branded residences compared to non-branded residences is that they allow investors to achieve regular operating returns while waiting for increases in capital value. Many branded residences offer a guaranteed yield for the initial years, but investors still need to thoroughly understand what is being offered and look carefully at their investment purpose. The key determining factors are whether investors would like to purchase for investment or their own use, whether there is trust in the brand itself, and whether it is in a preferred location. “Branded residences are selling well, with many developers continuing their push to build more and catering to the segment,” said Mr. William Tran, Head of Sales and Leasing at Colliers International Vietnam. With a price of $5,000-$6,000 per sq m at D1Mension, many view it as much more expensive than other high-end residential projects. However, according to Mr. Chen, the project’s advantages in location and amenities must be taken into account. “We have sold nearly 70 per cent so far and this is a good percentage for the first luxury branded residential project in the city,” he said. The developer also offers a premium on leases of 8 per cent over two to four years. Previous research from Colliers International found that world-famous ultra-luxury brands can potentially achieve a price premium of around 41 per cent compared to prime residential developments, whereas luxury brands can typically achieve a premium of between 21-40 per cent with high-end branded developments achieving a lower premium of 10-20 per cent. Developers and investors will both benefit, as a well-managed branded project will bring more demand for the location and resort, in turn driving up the exclusivity of the development and the owners’ investment. The majority of difficulties primarily relate to ownership, according to Mr. Tran, as housing laws were only changed in 2015 to provide some flexibility for foreign investors. Then there is sales prior to official launch, as many developers wish for confirmed purchases before construction is finished. Then comes supply versus demand, as even high net worth individuals can only purchase so many branded investments in the country. This segment will only become easier to promote as Vietnam continues to grow. The land reserves of prime areas in the heart of Hanoi and Ho Chi Minh City are becoming increasingly limited and will be an important factor that upstream clients will consider when choosing a place to settle, according to Mr. Gasparotti. Thus, consumers and investors are starting to pay more attention to centrally-located projects.